So Matilda is gone until next Halloween, and Squanto is here. Except for binding, Squanto is finished. I will work on binding the mat tonight. It will be around 12" by 13" when all is said and done. I had planned a larger piece with more of his shirt and ornaments exposed. But once I hooked it, the focus of the picture changed to his ornamentation, rather than his face. So I ripped out about 5" of hooking at the bottom, pulled out the dream-catcher circle in his hair, and worked to edit out all the details so that only his face, with all its gratitude, was left. Hooking this piece again reminded me that less is better. Period. Rip out what I don't like. Because just adding more hooking to what I already don't like isn't going to make me like it any better. It is tough to hook a "monochromic" picture. Now this really wasn't monochromic because I didn't use a single swatch of wool in one hue. I used five different, yet closely related swatches to give the impression of a monochromic picture, while allowing me some freedom to cluster certain colors against others. I also want to say that the background was really fun to do. I just used up my scraps from the rest of the piece, trying to cluster color and values to get a soft out-of-focus landscape background effect. Well it is after Halloween, and Matilda is still hanging above my fireplace in that wonderful shadowbox I bought a month ago. So this can't continue. Matilda has to come down. Her month is over. The problem is that I do not have a mat hooked to fill the space between now and Christmas when St. Nicholas will be pinned up. What to do? Guess I have to stop hooking the big Palette Constellation rug for a few days and get a Thanksgiving mat done. I browsed the web and located an antique photo circa 1900 that I fell in love with. Very soulful. And thankful. So I have started to work on it. I have a photo to the left of the colors of wools I am using: Wilde Wood 117; Faune Brown 114; Hubbard Fig 119; Sea Shells 142; Red Oak 144; Toadstool 121. All are 8-value packs. I am pleased with the way that Peter Cottontail turned out. I made him as part of my whimsical doll series: tall and thin. It is a little tricky to balance these dolls. You have to stuff the top 2/3rds with light batting and then the bottom 1/3 with heavy stuffing beads. This doll I backed with a quilt-like backing that I sewed from 3-inch squares of wool I had overdyed with the same colors in the hooked part of the doll. I still need to find the right eggs or tiny basket for his hands. But other than that, he is finished just in time for my Easter decorating. I needed a quick project to hook for a few days while I rest from the big rug, All in the Family. So I'm working on creating a new doll, this time one for Easter. I hooked the front in two nights, and sewed quilt squares of wool together for the back and base. I am going to whip the back onto the hooked front tonight, so I should have a doll to post tomorrow. For now, here is a preview: the hooked front and the quilted back. Or, I didn't have any course wool yarn or roving left to do his chest, so I spotted my selvage balls that I have sitting in a basket in my living room. Would it work? I tore up a few strips of the selvage to give them fluffy edges, then I dipped them in some tea I brewed, and threw them in the dryer. The result? When hooked it looks like bunny fur! Who knew I was saving those selvages for Peter Cottontail. I hooked a chain stitch on the edge of his coat to give it some extra texture. I haven't had any luck finding an egg ornament for his hands. Still working on that. When I get the pattern put together, I'll post a note that it is available. Also I know a promised a couple of you that I would get a pattern put together for Lady Sunset, so I will do that too! I finished hooking and sewing together a new Father Christmas doll. He is rather tall and slim, about 7" across and 21" tall. I hooked him using Hubbard Fig 119, Pink Iris 134, and Violet Twilight 132 (all 8-Value packs). His beard is created by hooking in sheep wool and letting the ends dangle on top. The hair and coat trim are hooked with natural yarn roving. I bound a black piece of wool on as the back, stuffed him, and sewed on an oval bottom. I added a silver snowflake for some sparkle. 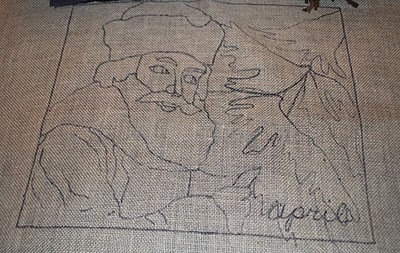 I am turning to work on my Santa 2010, Kriss Kringle. 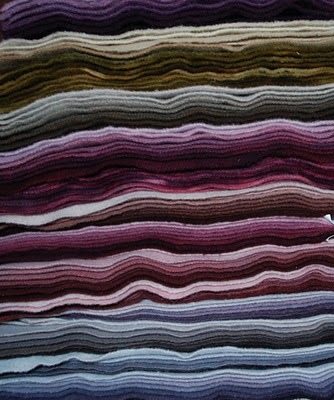 I have sketched him on the linen foundation and selected my wools. I am going to be using my Norfolk Family of wools, those created from my blue-purple dye (wool pack on the top of this pile). I think I am going to use a 4-cut for this one because I want to get some detail in the eyes and in the fir. It could easily be hooked in a 6-cut too. It will measure 13 1/2 inches by 16 1/2 inches. I am going to keep track of how I hook this piece step-by-step, and if I can arrange it, I am considering offering this pattern and instructions as an online VIP rug hooking course in September or October. So watch for that. This weekend I had the pleasure of attending a class that Carrie Martin conducted for the Stash Sisters here in Houston. She is a very creative person, and taught us how to make bags using needle felting and other embellishments. So I learned to needle felt, something I have been wanting to do since last year. I loved it! I will try to create a "basic how-to needle felt" post this week, but I wanted to share with you the little rug I finished from the class last night (I have not sewn the bag yet). Carrie gave each of us a little starter kit which included some roving and ribbon and yarn embellishments. I choose a red kit, and had all the intentions to go "abstract" since this is the direction that Carrie teaches the class and I am part of the 2010 abstract challenge. But as soon as I got the little red roving out and started to needle felt all I could think of was hearts and Valentine's day and chocolates. So my piece went in the representational direction instead of abstract, and in the end I hooked "Bon Bons Valentine". We have some cute holiday projects finished this week and posted on Rug Hooking Daily. Lurie McAdow posted her stuffed Hagatha (Among Friends design): what a great tooth! Cynthia Bell posted a darling stuffed snowman and fir trees (Fish Eye Rugs design): love the use of proddy for the needles! Jenny Anderson posted a big original rug she has been working on since July called Wade the Green Man. It is a portrait of her husband as a Green Man in winter. Great use of verse combined with portrait! I finished my block of the Stash Sisters raffle rug: Pan the green (wo)man in November. Congratulations to all of you who finished projects this week. Please post your pictures and information about your rugs on our Rug Hooking Daily group forum where we are centrally collecting our accomplishments every month! Every project finished counts! Now that the challenge is over, I can post pictures of Mr. Bonz. I created the skull for my son who wanted me to hook a skeleton for the challenge. Since an entire skeleton was too much for my 10-by-10 inch mat, we settled on a skull. I have been wanting to try to hook by using values instead of colors, so that is what I did with Mr. Bonz. It was not easy. I took pictures of him a couple of times while I was hooking the skull and converted them to black and white in iphoto so I could see the values better. When I saw a value too dark or too light in the black and white photo, I pulled it out and tried something different until the photo looked correct. I especially worked on the areas around his eyes and his cheeks where many strips appeared too dark. This is what he looks like now, in color and in black and white. To finish Mr. Bonz, I prodded mummy gauze on the bottom, and used off-white wool to bind it. I bought a plastic skeleton and sawed off the skull. I hung the skeleton on my wall and Mr. Bonz over the top. Here he is in my living room. Alexander is pleased as punch who picked out a skeleton costume for himself for Halloween. Here he is modeling it.